I heartily agree that it’s time DC brought back anthology titles. 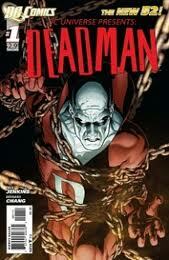 I NEVER RESPOND TO WEB SITES, BUT YOUR ARTICLE ON DEADMAN WAS MOST INFORMING! I TRULY ENJOYED YOUR WRITING STYLE! IT WAS QUAINT , YET COMPLETE. I LOVE THE COVER FOR THIS BOOK, EVEN THOUGH IT IS NONSENSICAL ( HOW CAN YOU BIND A GHOST WITH CHAINS? ) BUT I GUESS THATS THE PARADOX, OF DEADMAN EXISTENCE! HE IS ENSLAVED IN LIMBO. THIS CHARACTER HOLDS GREAT POTENTIAL FOR A GREAT TV SERIES .